Ceilings that channel shades of 1960’s Op Art and Mondrianesque room dividers seemingly forged from minimalist Japanese temple lamps, the drolly-named DRY is a marriage of contrasts, industrial interior in an historic building, buzzy luncheteria and sophisticated night-spot, where cocktails - stirred and shaken at two separate stations - accompany chef Andrea Berton’s menu of gourmet pizzas and preserved meats. By night, the unbuttered interior cuts an elegant dash as the artfully haphazard lighting and video installations curated by Paola Clerica come into their own. The brass elements lose their diurnal stridence and with the glossily aged parquet floor, reflect the glow in a manner sure to soften Junichiro Tanizaki’s heart - not to mention the stark expanses of white plastering interspersed with scrubbed concrete archways. 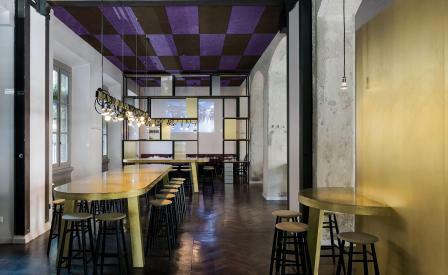 With interiors again conceived by Milan/Shanghai creative studio, Vudafieri Saverino Partners, the Vittori Veneto outpost gives the Milanese a second space to be dry.